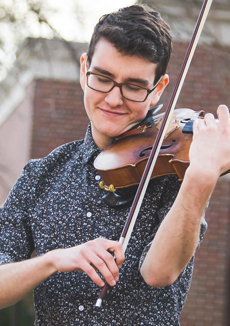 Lukas Shrout began viola studies at age nine and at thirteen, after attending Liu Post Chamber Music Festival, began taking lessons and studying chamber music at Stony Brook university Pre-College Division. He attended Kinhaven Music School and participated in the New york youth Symphony program which offered many master classes. in the fall of 2015 he entered the McDuffie Center for Strings where he studies with Rebecca Albers and Lawrence Dutton. He takes advantage of performing in master classes with the many visiting artists and performing on the Fabian Concert Series.